Assesses the strategic significance of the Internet relative to other communications channels and then deploys resources to integrate with marketing channels. 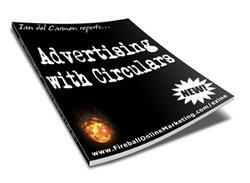 A business combining an online and offline presence. An organisation with principally an online presence. It does not operate a mail-order operation or promote inbound phone orders. Decisions 5 and 6 relate to multi-channel prioritisation which assesses the strategic significance of the Internet relative to other communications channels. In making this prioritisation it is helpful to distinguish between customer communications channels and distribution channels. Customer communications channels, which we review as decision 6, refer to how an organisation influences its customers to select products and suppliers through the different stages of the buying process through inbound and outbound communications. For a retailer, it refers to selection of the mix of channels such as in-store, inbound contact-centre, web and outbound direct messaging used to communicate with prospects and customers. 'Distribution channels' refers to flow of products from a manufacturer or service provider to the end customer. These may be direct to consumer channels or, more often, intermediaries such as retailers are involved. 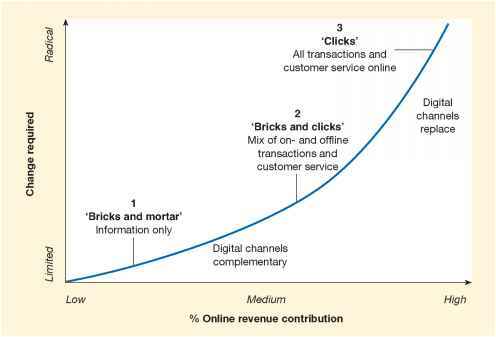 Internet distribution channel priorities have been summarised by Gulati and Garino (2000) as 'getting the right mix of bricks and clicks'. This expression has been used to refer to traditional 'bricks and mortar ' enterprises with a physical presence, but limited Internet presence. In the UK, an example of a 'bricks and mortar' store would be the bookseller Waterstones (www.waterstones.co.uk), which when it ventured online became 'clicks and mortar'. It initially followed a strategy of creating its own online presence, but now delivers its online channel through a partnering arrangement based on the Amazon.com infrastructure which is an example of the partnering strategy suggested by Gulati and Garino (2000). Internet pureplays or 'e-businesses' such as dabs.com which operate solely through their online representation are relatively rare. Dabs.com, which is featured in Case Study 7, uses its web site and e-mail marketing as the primary interactions with the customers. Other e-retailers such as Virgin Wines.com make more use of phone contact and physical mail with customers. Even dabs.com uses these channels where appropriate - for large-volume business customers. The general options for the mix of 'bricks and clicks' are shown in Figure 4.19. The online revenue contribution estimate is informed by the customer demand analysis of propensity to purchase a particular type of product. 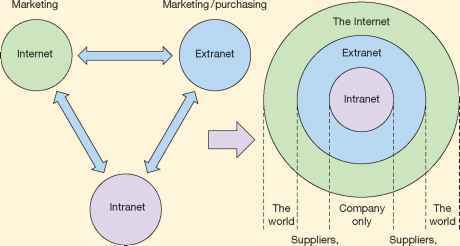 A similar diagram was produced by de Kare-Silver (2000) who suggested that strategic e-commerce alternatives for companies should be selected according to the percentage of the target market using the channel and the commitment of the company. The idea is that the commitment should mirror the readiness of consumers to use the new medium. If the objective is to achieve a high online revenue contribution of greater than 70% then this will require fundamental change for the company to transform to a 'bricks and clicks' or 'clicks-only' company. 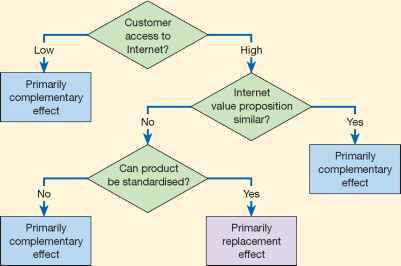 Kumar (1999) suggests that a company should decide whether the Internet will primarily complement the company's other channels or primarily replace other channels. Clearly, if it is believed that the Internet will primarily replace other channels, then it is important to invest in the promotion and infrastructure to achieve this. This is a key decision as the company is essentially deciding whether the Internet is 'just another communications and/or sales channel' or whether it will fundamentally change the way it communicates and sells to its customers. • the product can be standardised (the user does not usually need to view to purchase). Only if all four conditions are met will there be primarily a replacement effect. The fewer the conditions met, the more likely is it that there will be a complementary effect. From an analysis such as that in Figure 4.20 it should be possible to state whether the company strategy should be directed as a complementary or as a replacement scenario. As mentioned in relation to the question of the contribution of the Internet to its business, the company should repeat the analysis for different product segments and different markets. It will then be possible to state the company's overall commitment to the Internet. If the future strategic importance of the Internet is high, with replacement likely, then a significant investment needs to be made in the Internet, and a company's mission needs to be directed towards replacement. If the future strategic importance of the Internet is low then this still needs to be recognised, and appropriate investment made. Although it is logical to believe that firms who are selling search goods of low tangibility have a natural advantage in Internet commerce, it is important to understand that all products have some degree of tangibility and a mixture of search and experience components. The only difference is the relative ratio of such characteristics. For example, a pair of jeans is an experience good with high tangibility, but the size and fit can be easily described using standard descriptions. Similarly, a piece of software is a search good with low tangibility, but the functionality of a software package cannot be fully appreciated without 'test-driving' a beta release.